BOOR BRIDGES' INSTALLATION AT THE AMES COTTAGE PACKS SEVERAL PLANT TYPES INTO A SMALL SPACE. Creating an irrigated stone planting system among terraces and windows, the Hanging Gardens of Babylon triumphed over soil, water, weight, gravity, and erosion, a feat so spectacular that it became one of the Seven Wonders of the World. Two thousand years later, architects are still striving to incorporate the demands of plants into architecture, with results almost as dazzling. In San Francisco, where a Mediterranean climate creates a conducive environment for growing a staggering array of plants, interest in vertical gardens, or green walls, has gone viral. 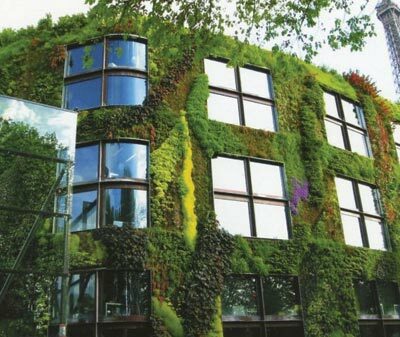 Earlier this year, the worldwide master of the form, Patrick Blanc—known for vertical gardens at the Quai Branly Museum in Paris and the Caixa Forum in Madrid, among other installations—created a stir when he arrived in the city to begin work on the largest vertical garden in the U.S., a 1,700-square-foot growing wall at the new Drew School. Shortly afterward, following the opening of an AIA San Francisco photo exhibit on vertical gardens, landscape architect Andrea Cochran received so many inquires from architects she “couldn’t count them.” The AIA exhibit proved popular enough that the chapter extended it another two weeks and added a lecture on the subject for Earth Day. A RENDERING OF A PLANT-COVERED WALL FOR SAN FRANCISCO'S DREW SCHOOL. Amid this explosion of interest in the subject, architect Seth Boor of San Francisco–based Boor Bridges, and Flora Grubb, owner of the eponymous San Francisco nursery that’s a favorite of design types, have completed several such gardens, albeit on a small scale showing what’s possible with planted walls. Their collaboration also represents an example of the new relationships architects will need to have with plant experts to see their ideas through to fruition. After designing Grubb’s Bayview shop in 2007, Boor collaborated with Grubb again during the remodeling of the Ames Cottage, a private residence in San Francisco. Outside the 840-square-foot home, Boor carved out a 4.5-by-12-foot area that was surrounded by buildings on three sides, yet surprisingly well lit. The space recalls “these little leftover outdoor spaces like light wells and courtyards that are so commonplace in San Francisco,” Boor explained. With a patio in mind, he raised the grade with a wooden deck, then had it covered in inexpensive slate. French doors continued the garden-like feel. Originally, Boor envisioned a planter box containing a simple stand of bamboo growing up the wall. A traditional in-ground garden was deemed unsuitable because “we couldn’t have stuff blowing in,” Grubb said. “We needed it to look tight and not produce any mess.” Then Boor remembered the succulent wreaths he had seen at Grubb’s shop during the holidays. The low-water plants do not require much soil and have a beautiful sculptural profile. To create what is essentially a vertical flower pot, 20-inch plastic panels from the Canadian company ELT were inserted into a 60-by-40-inch wooden frame constructed by Grubb’s husband, Kevin Smith, the cottage’s general contractor. The frame was made from waterproofed plywood on a French cleat, creating a space between the wall that could accept an irrigation line. As the plants grew in, the plastic panels disappeared, while the more appealing wooden frame remained. 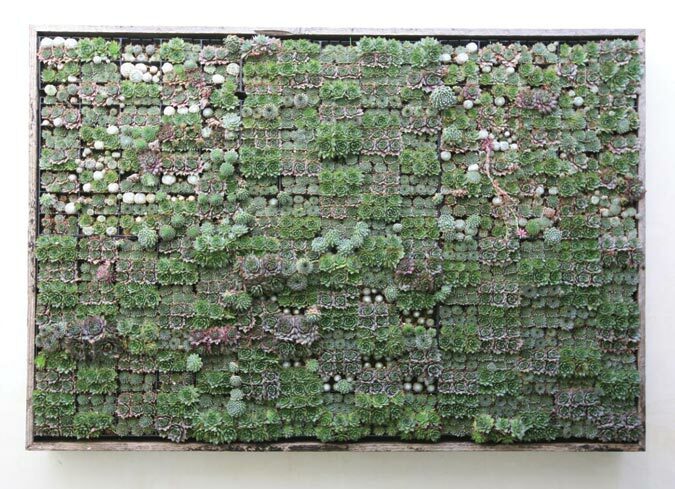 Pleased with their success, Boor, Grubb, and Smith later created an 80-by-60-inch garden, again using succulents, which hangs on an exterior wall at Grubb’s shop. Last year, the architect and plantswoman were asked to construct four living wall panels at the entrance to Bardessono, a sustainable luxury hotel in the Napa County town of Yountville, a few months before its opening. (The tradition of using cut flowers at the entry wasn’t considered advisable for a hotel applying for LEED Platinum status.) The only criteria: No irrigation or drainage could be utilized. Grubb ended up choosing several varieties of tillandsia, a type of air plant, which only require light and an occasional misting. Boor had them mounted on a peg system against a backdrop of rusted steel, which had been used elsewhere in the hotel. Again, Smith did the fabrication. In another variation on the theme, Grubb installed a vertical garden on her own last year using the Woolly Pocket system at the San Francisco women’s boutique Shotwell. Woolly Pockets allows for a more horizontal gardening experience, thereby expanding the variety of plants that can be used. Over the past year, Grubb has fielded numerous inquiries about such gardens, but once architects discover the price (over $100 a square foot) and the light requirements, many never take root. Nevertheless, demand has continued to grow. Recent projects include a living wall for biotech giant Genentech and a light court wall for a four-unit building in San Francisco’s Pacific Heights. The team is also installing quirky planters near the corner of Castro and Market streets, part of the city’s Pavement to Parks program. VERTICAL GREEN PANELS FLANK THE ENTRANCE TO THE BARDESSONO HOTEL IN YOUNTVILLE (LEFT) AND A DETAIL OF THE VERTICAL PANELS (CENTER). A LARGE-SCALE GREEN WALL INSTALLATION AT THE PNC BANK HEADQUARTERS IN PITTSBURGH (RIGHT). COURTESY BOOR BRIDGES AND GREEN LIVING TECHNOLOGIES RESPECTIVELY. Plant selection is key. “Not every kind of plant will grow in a small plastic cell on the wall,” Grubb noted. And products also have a ways to go to catch up with the demand. “Many aren’t very good ideas for plants” and are “ugly plastic trays,” she observed of available planting system options. Indeed, the reason Patrick Blanc’s large-scale vertical gardens are so successful, she said, is because they are hydroponic. 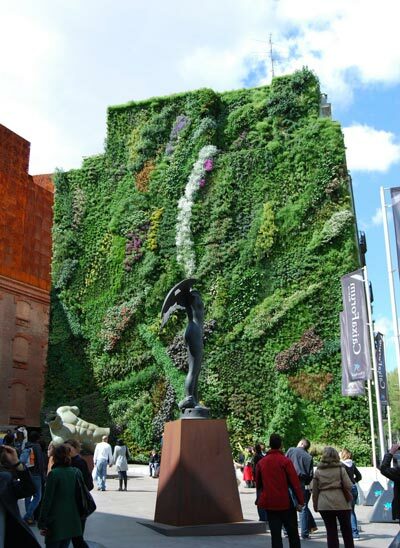 Boor and Grubb continue to explore other plants that might submit to green wall conditions, and other structures that can expand the expressive range of vertical gardens. “Within a year, we’ll come up with something new and different,” Grubb said. Bay Area–based writer Joanne Furio is a frequent contributor to AN.